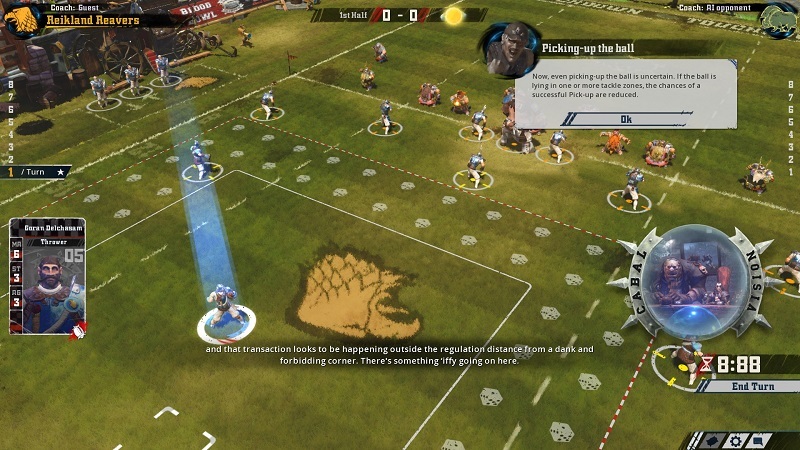 Blood Bowl II is a sequel to the video game version of the tabletop game that gives new meaning to the term "Fantasy Football". It's a twist on the oft visited theme of Humans versus Orcs with the odd Elf, Dwarf and rat like Skaven to flesh out the lineup. 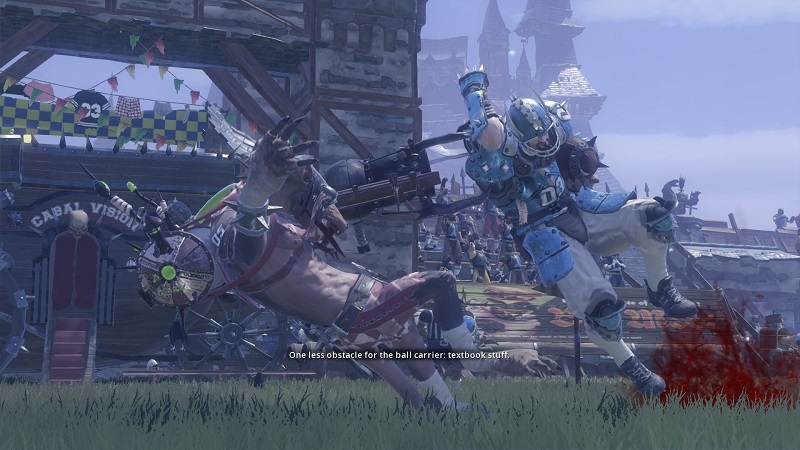 How Blood Bowl is different from American football and why anyone would be interested in the game (even if they don't like sports) can be summed up in two ways. First, it plays like a turn based strategy game rather than a full on Madden-style sports game. Second, it is a pretty violent game. Rather than tackle the guy with the ball, anyone on the field is fair game. Clobber a hole in the defensive line, sack the ball carrier, push an unfortunate player off the field to be beaten down by the fans. Not only do players get knocked out for a few turns but in some unfortunate scenarios they can die outright forcing you to replace them. The worst case is seeing a player you've sunk time into leveling up be killed and removed from play. Winning, losing, and death all hinge on dice rolls. Players have various stats and skills and these numbers determine the difficulty of a roll. "Difficult" in this case may require you to roll a six whereas a safer roll may need a much lower number. During a match up, these stats determine how many dice you get to roll in a turn. Normally you get to choose which dice. A skull (with a value of 1) can knock out the attacking player and end their team's turn thereby discouraging reckless play, though you can certainly try if you are the gambler type. During really mismatched moves the dice may be red, meaning your opponent gets to pick the dice. As an example, you roll for a chance to either knock an opposing player down or push them back a square. The other team is likely going to choose to be pushed back rather than waste a turn getting them back on their feet. However, if you roll a skull and a knockdown, its obvious what the opponent would choose if given the chance. The luck of the dice can be harsh but a reroll system is a nice counterbalance to how quickly luck can turn against you and upset the most sound of strategies. You can only reroll once a turn and when used, it's gone until the half is over. One game is comprised of two halves that are made up with eight turns. The graphics of Blood Bowl II aren't exceedingly mind blowing but they are very good. The animations, particularly when players attack each other, are brutal looking. If you feel the game stops too much for these scenes they can be turned off in the options The campaign is nothing more than a tutorial set to a light story that has you leading the all-human Reikland Reavers back to glory. I have mixed feelings about the campaign. It was fun, and the commentary between matches was often hilarious. 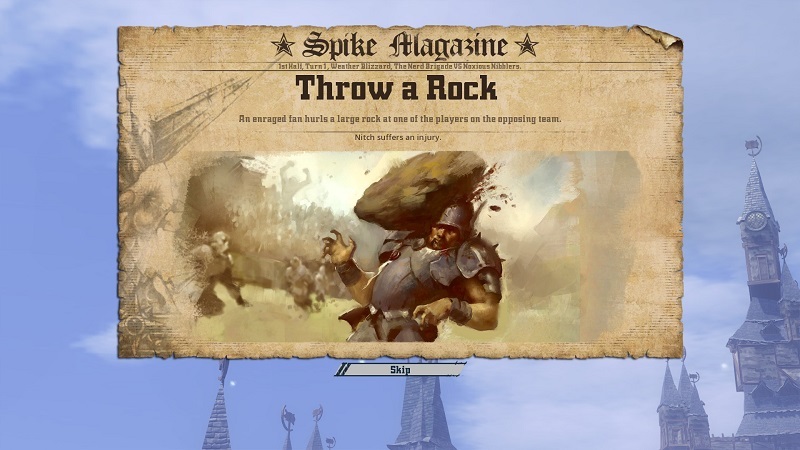 The story did have a few memorable moments and objectives such as knock out a certain type of player or such. Nothing to fancy but it was a good introduction to the different races you'll face and the challenges they may bring. While the in game commentary can get a bit repetitive and boring, I enjoyed the banter between the two commentators between story matches.What I didn't like was how it staggered its lessons. Each match became more and more complex as each one introduced a previously unknown new rule. At first you just attack the other team to get your ball to the goal. Then it adds a chance for each action to fail. THEN you learn that if you fail an action you lose the rest of your turn. All that could have been taught at once in the first round. Later tutorials introduce stats, skills, and player deaths. The problem is, you'd get used to one set of rules and then it adds all sorts of new layers. Some people may like this but I'd rather be taught things in large chunks. It wasn't bad exactly, it was rather informative. It just felt a bit drawn out and takes a bit longer than I'd like to feel like you are finally playing the game for real. The multiplayer is where the heart of the game lies. There is a solo league option for play against AI or you can create and register a team for the online leagues against real people. Friendly Matches let you play ether against an AI, a friend, or even a local player in a match that wont have any long term effects. Local Play (at least on PC) lets you play multiplayer by literally taking turns with the mouse. Team Creation is fairly simple. Pick your race, buy players with starting funds, name your stadium and team motto, buy any extras with money left over, and begin playing. Each race has its own advantages and disadvantages. Skaven is the only team capable of scoring a touch down in one turn and humans are a great all round team. Some teams are designed to clobber opponents while others are great at a passing game. Your team is given a value after its creations and gives a general idea of how it will perform against other teams. One thing that add to my defeat was that I didn't fully understand inducements. I clicked on without paying attention, but those will let you buy temporary items for the current match in case you feel grossly outmatched. My freshly created team had a value of 870. I picked random opponent in a league that specified "New teams only" and was promptly pitted against a team with a value of 1400. The beauty of the game, in my opinion, is that even if you are horribly mismatched, you never know what the outcome will be. It all comes down to playing smart and rolling the dice. Adding to the randomness is the chance a random event may happen during kickoff. These events can have various effects such as taking out a random player or letting one team move a bit early. You could try being more defensive for example. Each player has a tackle zone around them. An enemy running through this zone has to make a roll to see if he trips. When I found myself outmatched, my strategy was to not roll more than necessary. I also positioned my players that would force my opponent to make checks or roll to knock them out. Which he did, quite often and successfully, but I like to think I made him work for it. One of my players died in the process only after scoring the winning point of the game which felt like a tiny victory in and of itself. He may have killed a player, and I probably inadvertently helped him level up a few of his own, at least I can say I didn't let him score touchdown after touchdown. I also had a moment or two of my own that, while unfruitful, were memorable. I managed to evade several players in one run and pick up the ball when it was supposed to be his. One of the chances to evade was as low as 16, the rest were 33, and then he had to make a 83 percent roll twice for going for it (that is, moving 1 or 2 squares furthest) and THEN had to roll a percent chance to pick up the ball. And some how, almost miraculously he made it. Unfortunately the other player had the more sound strategy in the end and managed to get the ball back, and the mircle never happened. But those few moments were very thrilling. Sometimes you just have to take your chances, Unlike some games where you just lose and that's it, I felt like I learned a little that match. That was of course, the story of my most memorable lucky moment. There have been a few times when I've rolled all skulls, used a re-roll, only to get all skulls again. All in all, I really enjoyed the game. 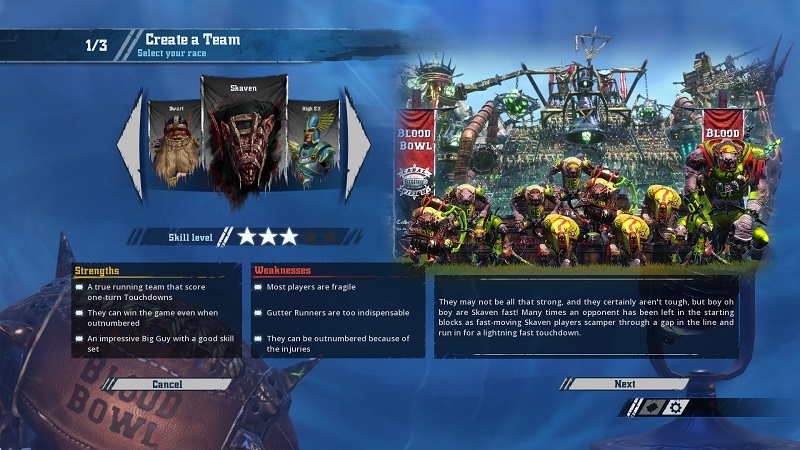 The main thing I could see returning fans being disappointed with is the lack of playable races--eight out of the box with two coming as DLC--compared to Blood Bowl: Chaos Edition's 23. The fancier graphics in Blood Bowl II came with a price. Other than the somewhat drawn out tutorial, my only other complaints are relatively minor. When you score a touch down you see the same cheerleaders no matter if you are human or not. That's not so bad as we can just assume perhaps nobody wants to see an orc cheerleader. A little more immersion breaking is when a player is pushed off the field, the fans that trample them are always human. It's a bit surreal when you are playing as one. As I said though they are minor details and don't really add or take away from the game aside from the aesthetics. All in all if you are looking for a fun strategy sports themed game with a multiplayer focus, this one might be worth taking a look at. All in all, I found it to be a rather fun game, Though that's not to say it wasn't rough around the edges in spots. With plenty of loot to grab, a nice variety of weapons, big bosses, scaling difficulties, and the ability to craft powerful gear, I'd definitely say it would be worth looking into for fans of the genre. It's a shame that Far Cry 3: Blood Dragon was forced to be a type of game it clearly isn't. A game just called "Blood Dragon," free of its open-world tropical heritage, would have given developers the flexibility they needed to do their vision justice. Compared directly to Far Cry 3, Blood Dragon is a mediocre Far Cry experience. In a more broad scope, Blood Dragon is an unfocused mess that could have used some fat-trimming in development. Fans who just want more Far Cry 3 or have particular nostalgia for the 80's could certainly find worse ways to spend a rainy Sunday afternoon, but you'll have to hear some terrible jokes to get there. As much as I like the Bloodbowl tabletop, I’ve never felt that it translated well into video game form, and Dungeonbowl didn’t change the way I feel. While it makes some very welcome changes to the formula, it is still little more than a simulator of the tabletop experience. The game is full of charm and little references that made me smile. From finishing a level and the leader saying "Controlling makes me feel good" a reference to the Ghostbuster's song of the 80s. To potential employee names like "Mr. B" and "Bill Venkman," It's a game brimming with good fun. Pardon the pun.